Psyllium Husk: Best Constipation & Colon Cleansing Herbs. Promote Healthy Relief for Constipation. Psyllium comes from the Plantago Psyllium plant. Its husks are harvested to be used as an active ingredient in many popular colon detoxification programs or natural constipation remedies. The husk of the psyllium is primarily composed of mucilage or water soluble fiber. The psyllium is extracted from the husks of the plant's seeds and is known to improve digestion, cleanse your system of harmful toxins or also act as a natural appetite suppressant. Furthermore, the dietary fiber found in Psyllium is much higher than the dietary fiber found in other sources of whole grains such as wheat or oat bran. This fiber is different than other fibers in that it will not cause the usual gas and bloating feeling. As psyllium fiber moves through the digestive tract, it absorbs water, swells and forms a gel and makes the stool larger & softer, thus relieving constipation and improving bowel movement and regularity. Psyllium fiber breaks down, softens, and eventually excretes all of the dried fecals & toxin matters that are being stored in your colon for extended time. Psyllium fiber along with other herbal colon cleanse nutrients are featured in Natural Assets' ColonACH (Advanced Colon Health). Click here for additional information. Through bowel movement, psyllium also takes along with it bad bacteria and parasites that are not only causing your colon to function poorly, but also causes other health issues. 2. Exercise to activate the psyllium fiber, promote constipation relief and speed up colon detoxification and colon clensing. 3. Increase fiber in daily intake through whole grains, fruits and vegetables to help activate a thorough colon cleansing diet and constipation relief. Psyllium is one of the best colon cleansing fiber & colon cleaners. It helps to promote colon health and accelerate the gut & colon cleaning activities in the digestive and intestinal system. Psyllium fiber should be a part of a recipe for natural colon cleanser. Furthermore, various studies have shown positive results of psyllium on serum cholesterol level. A study in 1988 with 26 men who have mild to moderate high cholesterol who were given psyllium and placebo to take with meals. After 8 weeks, the psyllium group reduced their total cholesterol by 14.8 with no negative side effects. 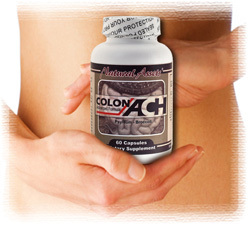 Psyllium, Glucomannan along with other natural colon cleansing nutrients are featured in Natural Assets' ColonACH (Advanced Colon Health). Click here for additional information.